It’s ironic that such a relaxing, restoring and expressive activity—making art and crafts—can also be so toxic. Although legislation controlling many of the dangerous ingredients in hobby materials has recently been passed, exposure to certain art materials remains a health risk. Check this list of where toxic dangers lurk in art and craft supplies, and tips for safer use. Toxic chemicals in the home can be eliminated simply by making thoughtful choices in the supermarket after educating oneself about what the hazards are of common consumer products. Lead in ceramic glazes, stained-glass materials, and many pigments. Cadmium in silver solders, pigments, ceramic glazes, and fluxes. Chromium in paint pigment and ceramic colors. Manganese dioxide in ceramic colors and some brown oil and acrylic paint pigments. Cobalt in some blue oil and acrylic paint pigments. Formaldehyde as a preservative in many acrylic paints and photographic products. Aromatic hydrocarbons in paint and varnish removers, aerosol sprays, permanent markers, etc. Chlorinated hydrocarbons (as solvents) in ink, varnish and paint removers, rubber cement, aerosol sprays. Petroleum distillates (as solvents) in paint and rubber cement thinners, spray adhesives, silk-screen inks. Glycol ethers and acetates in photography products, lacquer thinners, paints, and aerosol sprays. 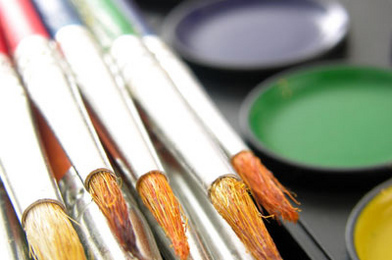 In painting and print making, ready-mixed water-based paints or inks can be used. If you must be exposed to paint dust, use a toxic dust respirator approved by the National Institute for Occupational Safety and Health (NIOSH). Ventilate the space thoroughly whenever using any kind of solvents, whether in painting or in lithography, intaglio, or photoetching. Solvents should be avoided while pregnant. Enamels are usually lead-based, and can contain other toxic metals such as cadmium and nickel. Use lead-free enamels whenever possible, and make sure kilns are vented outside. Outside vented kilns are important, as is careful choice of materials—most potters know to avoid glazes and lead frits, but many don’t know that flint, feldspars, fluorspar, and some compounds containing barium, lithium, manganese, or nickel can also be toxic. Children should avoid the pottery studio, as they are more highly susceptible to the toxics used in pottery than adults. Photography presents a number of toxic hazards which are difficult to avoid. Minimize exposure to photo chemicals by using gloves, mixing chemicals in a mixing box with holes in the sides for gloved hands, and providing adequate ventilation. The Health and Welfare Office in Canada suggests at least 10 room air changes per hour in the darkroom. Children under 12 should avoid the darkroom. To check the toxicity of specific products, The Art & Creative Materials Institute, Inc. (ACMI) has a searchable database of non-toxic art and creative materials for children and artists. Adapted from "Safe Substitutes: Non-Toxic Household Products" by Gary Davis and Em Turner, from The New Village Green edited by Stephen Morris (New Society Publishers, 2007). Scary - wrap up warm and paint with the window open! I'm glad to see that watercolours and coloured pencils don't seem to figure on these lists. but I'm off to check a link supplied.